Starring Ben Foster, Thomasin Harcourt McKenzie, Jeff Kober, and Dale Dickey. Father and daughter, Will and Tom, have lived off the grid for years on a nature reserve on the edge of Portland. But their cover is blown by accident and they’re removed from their home to be put in the care of social services. Adapting is a struggle, especially when father and daughter find they want different things from their lives. Eight years have passed since Debra Granik gave us Winter’s Bone and introduced us to the hitherto unknown Jennifer Lawrence. 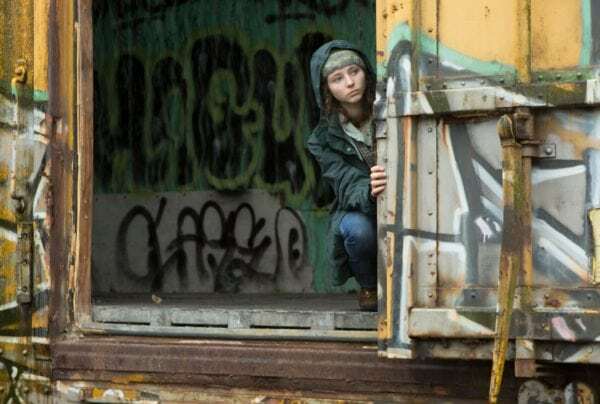 In Leave No Trace, which has its UK premiere at Sundance London, she’s on familiar territory and puts new, fresh talent in the spotlight all over again. It’s another father and daughter story, but with dad as much centre stage as the teenager. 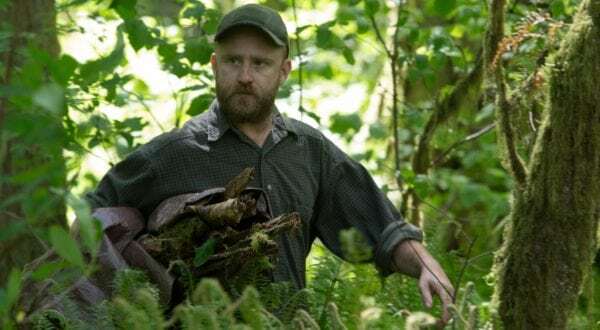 Will (Ben Foster) and Tom (Thomasin Harcourt McKenzie) have rejected conventional lifestyles, living instead on a nature reserve just outside Portland, totally undetected by the authorities. Until a chance encounter leads to their discovery and their lives are taken over by the system they’ve been trying so hard to avoid. Thrust into the system, they find it difficult to adapt and eventually set off into the wilderness, where they find they have to decide individually what they want out of their lives. Adapted from Peter Rock’s book, My Abandonment, it’s based on a true story about a father and daughter who had an equally unconventional way of life. 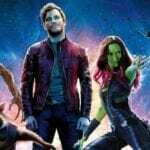 The reasons behind it are explained in sparing cinematic language: we learn that Will is an ex-serviceman through one solitary sound, the beating blades of a helicopter. There’s hardly any mention of Tom’s mother, so any conclusions about what happened to her are your own. But as Will’s desire to escape society is clearly the result of PTSD, it’s a safe assumption it put pressure on the relationship. He’s direction-less, unable to stay in one place for too long, unless he’s in control of it and can establish some form of routine, all of which stems from that military background. While it’s an examination of outsiders and army veterans who find themselves cast adrift, it’s also Tom’s coming of age story. In front of our eyes, she starts out as an obedient daughter who follows her dad’s instructions to the letter. He’s educated her in an academic sense but under his guidance she’s also become resourceful in the great outdoors and he relies on her heavily. While living in their first home with four walls, she makes friends of her own age, is exposed to things that we all take for granted – TV, mobile phones – and when they venture off to the wilderness things are never the same again, not just for her but between the two of them. She can’t forget her short experience of that other life and wants something more. And that transition is reflected in the cinematography. The nature reserve in Portland is full of brilliantly green, glossy foliage and looks idyllic. When they reach the woods in Washington State, it’s shrouded in mist, the colours are muted and whole effect is cold and unwelcoming. The bond between father and daughter, however, is still as strong as ever and the performances from Foster and McKenzie are truly outstanding. Foster has never been better: patient, reserved but damaged underneath, it’s a muted piece of acting and all the better for it. McKenzie’s debut sees her teenager having to take on adult responsibilities but never losing the innocence that goes with her age. 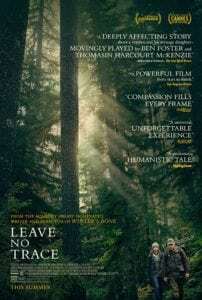 Leave No Trace is outstanding, a film full of heart and hope, one that involves with its compassionate tone and dazzles with its storytelling skill and artistry. One of the films of 2018 for sure. Leave No Trace is screened at Sundance London 2018 on June 3rd and goes on general release in the UK on Friday, June 29th.